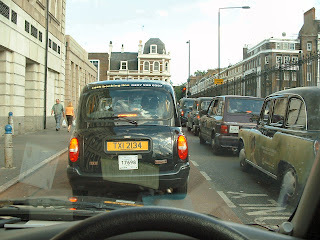 Two worlds collide in a London taxi. Bissane El-Cheikh was one. It was just another rainy day in London. Only a few golden rays escaped through the window without really warming up the air even though it was mid-July. Fifteen days have passed so quickly and I'm leaving now. The taxi should be waiting downstairs. I find my way to the street carrying a heavy suitcase, not because of the shopping I did, but rather the old stiff Samsonite bag itself. The white car was waiting for me as expected, but to my surprise it was a lady driver who came out to open the door and help me with the luggage. I'm not sure I succeeded well enough in hiding my reaction, so the best I could do was start a vague conversation about the weather. Like me, she was feeling cold. I knew this because she started jumping from one foot to another and rubbing her forearms with her tiny hands. Something in me felt protective, like a gentleman. I heard myself asking her firmly to "get in the car", adding "you seem to be freezing". She obeyed, even if she was not too fond of my "friendly" attitude, or so I sensed. After all, I was a woman like her and maybe even a couple of years younger. But I just couldn't let her open the door for me or carry my heavy suitcase. She was a small brunette who had probably woken up a bit early to drive me to the airport. I felt a kind of sympathy: something in her face took me back to my childhood when I had to get up and go to school while my bed seemed so much warmer. I jumped into the back seat of the taxi and, as if to apologise for my bossy attitude, asked her: "You are not British... are you?" She gave me a glance in the rearview mirror and answered, "nay... I'm Israeli, and you? You are Arab... It's obvious from your name". She pointed to a small screen in front of her, where she had my address, my name and a "roadmap" to the airport. I found myself with an Israeli driver, and as a Lebanese it was against the law to mingle with the bad neighbour. In fact, she wasn't the first Israeli I had met. In 2004, at a hotel lobby in Washington DC, I met Adina, a peace activist who told me unforgettable stories from the other side of the border. But this was another story, for now I'm stuck in this car and there was nothing I could do. I was sure I hadn't succeeded in concealing my fresh surprise, not to say disappointment. All I did was answer back with a smile and say, "yes, and not just any Arab. I'm your Lebanese neighbour". I half-expected her to drop me out of the car straightaway. Instead, she seemed happy and took a small lunch-box from the seat beside her, reached back to pass it to me and said "Look at my lunch today, it's grape leaves stuffed with rice. Please try them and tell me if they're good". I was not sure I wanted to eat warak arish (dolma) at 9 in the morning so I apologised, explaining that I hadn't yet had my dose of caffeine for the day. She totally understood, because she too needs to drink "a jar of coffee, as any middle eastern" in order to wake up. I was glad she didn't take my refusal for an insult as Arab folks from the region usually do. We started talking about the best way to cook warak arish and how to choose the best leaves. She said she learned the recipe from her Syrian grandmother, but she always had the feeling that something is missing. I told her how to cook them with meat, and all of a sudden I asked her to "give me that box so I can try what's inside". She was delighted. I ate one and really liked it. They were big "like the ones my grandma used to make", I said, laughing. My grandma never really cared about the way the stuffed leaves looked, her main interest was to make them juicy and delicious. "Maybe you should add some tomatoes and parsley" I advised my driver, as the Mediterranean cuisine conversation continued. We made fun of fish and chips and of Brits who never feel cold "like us". We were talking loudly by this time, interrupting each other from time to time, using our hands to explain things, as if to catch up on a previous conversation. Political issues seemed as far as our countries... we were talking woman to woman. She had come to London twelve years earlier, and was divorced with a 14-year-old daughter. I felt I should have been sitting next to her and not in the back-seat, for I had to bend to the front to hear what she was saying. The timbre of her voice and pronunciation sounded familiar to my ears, English words flying out of her mouth with a Mediterranean or middle-eastern flavour. When she warned me to "wear your seat-belt, it's safer", it was in the same friendly and sincere tone. Yet I suddenly thought: how cynical, an Israeli caring about my safety. I would never tell Hassan, who lives in the southern Beirut suburb of Dahieh which destroyed during the war of July-August 2006, and whose house remains under a pile of rubble. I told her I was a journalist. "From al-Jazeera?" she asked, and added promptly "because I hear that those guys keep saying bad things about us... but why do you hate us?". The question slapped me in the face. Was she naïve or was she taking me for stupid? I didn't know what to think of her attitude but I answered with a mocking tone, "well, you're not the best neighbours one can dream of". The atmosphere became a bit tense, and it didn't help when she started asking about Fatah and Hamas, calling them the "goodies" and the "baddies". My driver was from Eilat, and she said she knew more about her Egyptian neighbors, than about us, Lebanese. But she was so confused with the political scene in "our countries", that she thought that Hizbollah was Hamas and Hamas was Osama Bin Laden and the latter was the Taliban. I tried to explain to the best of my ability the difference between all these factions, saying that for us Arabs, the Israelis were the one and only "baddy". Then my driver came up with the wisdom that we really didn't know anything about each other as people, and that we were drawing horns and tails on one another as a consequence. I agreed, before she suddenly reversed gear and asked, "now honestly did we take any land from you?" Through my shock, I tried to explain that "they" took the whole of southern Lebanon, if that means anything to her, before withdrawing in 2000, but that they still owed us some hills. I went on to say that they should understand more than any other people the meaning of this land since they invaded "our countries" for this specific reason. My voice wasn't friendly anymore, and the conversation had stopped being a two-way dialogue. All of a sudden words like "us" and "you" (in plural) were being thrown around. We were on a verbal frontline. Horns and tails started growing on both of us. Her facial expression lifted, but all she said was, "oh! We're really bad... but come on, you can give us the hills! It's the only place where we can see the snow. Not that I like skiing, but still...". Her jovial attitude led me to relax into the back seat of the white car. I cooled down, realising how easy it was to get upset and in consequence to talk past each other. As we neared our destination I became aware that I wanted to know more about her. But I was too shy, or ashamed, to tell her that I'd love to see her again, continue our conversation, exchange more recipes and maybe hang out together, in better circumstances. I couldn't even ask her for an email address. For even now, I shouldn't have been talking to her. I told her, my voice no longer strong, "you know, it's forbidden for a Lebanese to talk to an Israeli, and supposedly I never met you". She was stunned. She asked if it was because of her religion. "It's politics", I said, "not religion". Then I uttered some vague words about Jewish communities in some Arab countries, without being able to elaborate more. We had arrived in front of Heathrow airport, it was too late to extend the conversation. We got out of the car. I was happy this time to let her help me with the suitcase. We shook hands. "I'm Iris, by the way" she said. I took a couple of seconds to explain that my own name comes from the name of a region in Palestine, "not Israel". We laughed... It was very nice meeting Iris, and even better in London!